The Fairmead Landfill fossil site was discovered in May 1993 during excavation of an expansion cell at the Madera County Fairmead Landfill. The site has since yielded the first diverse Irvingtonian-age (mid Pleistocene) fauna from north-central California. The animal remains found here have been dated to around 780,000 years ago and include mammoths, horses, camels, deer, pronghorns, ground sloths, wolves, and big cats. Madera County, across the street from Fairmead Landfill. There are three mid to late Pleistocene formations in the eastern San Joaquin Valley, all of which occur at Fairmead Landfill; Turlock Lake Formation, Riverbank Formation, and Modesto Formation. All fossils from the site have been unearthed from the Turlock Lake Formation. In May 1993, while excavating for a new five acre expansion cell at the Madera County Fairmead Landfill, north of Madera County and just southwest of the junction of state highways 99 and 152, a Madera Disposal Systems crew encountered vertebrate fossils. Because the land is public property owned by Madera County, the California Environmental Quality Act (CEQA) requires that scientifically significant fossils be protected. Shortly after the initial discovery and at the invitation of the Madera County engineering department, J. Howard Hutchison and Robert Dundas of the University of California Museum of Paleontology (UCMP) at Berkeley travelled to Fairmead Landfill to assess the findings and recommend an appropriate course of action in order that Madera County adhere to state regulations. The UCMP recommended that fossils be salvaged and preserved as they are uncovered by landfill excavation activities. Paleontological monitoring has been ongoing ever since. Under the direction of curator/collections manager Dr. Robert Dundas, California State University, Fresno oversees the management of the Madera County Paleontology Collection, which houses the fossil specimens found at the mid-Pleistocene Fairmead Landfill locality. 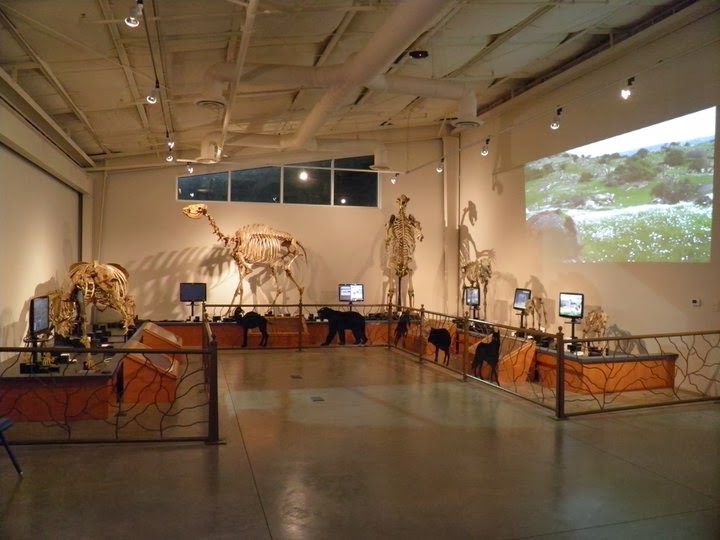 The San Joaquin Valley Paleontology Foundation manages the Fossil Discovery Center of Madera County, which displays the specimens found at the Fairmead Landfill fossil site. The foundation also oversees the paleontology mitigation program at Fairmead Landfill, monitoring the site to collect any fossil specimens that may be uncovered during excavation by heavy equipment operators. The Pleistocene is divided into two land mammal ages; the Irvingtonian (1.8mya to 240,000ya) and the Rancholabrean (240,000 to 11,000ya), both ages are named for California fossil sites. In general, Irvingtonian-age sites and fossils are rather sparse compared to those of the younger Rancholabrean. The Fairmead Landfill site is therefore important in enhancing our understanding of vertebrate faunas from that time. The fossils unearthed at the Fairmead Landfill were found in alluvial fan, fan channel, and marsh/lacustrine sediments. The presence of the Western Pond Turtle (Clemmys marmorata) and waterfowl of the family Anatidae further indicates the presence of a perennially wet environment which had been surrounded by semi-arid grassland. Fairmead Landfill site 780,000 years ago. Artwork by David Douglas. As with any fossil site, the smaller animals are the greatest indicators of the paleoenvironment. At Fairmead Landfill, these included smoothed-toothed pocket gophers (Thomomys), kangaroo rats (Dipodomys), and hares (Lepus). Pocket gophers prefer areas with high primary productivity and nitrogen soil concentrations. Their presence at the site reveals that the habitat was very fertile with a diverse plant community. The pocket gophers themselves likely played a valuable role in aerating the soil. Kangaroo rats live in arid to semi-arid habitats with sandy or soft soils suitable for burrowing. Known as desert animals, kangaroo rats have adaptations to conserve moisture and rarely visit standing water, although they will drink occasionally when this is available. The presence of kangaroo rats at the site reveals that the land surrounding the marshy area was a semi-desert habitat similar to that of southern California today. Hares are grazing animals that favor open spaces with abundant food in the form of grasses, shrubs, and forbs, and their remains reveal that such vegetation was dominant at the Fairmead site. Other small vertebrates recovered here include Desert Tortoise (Gopherus agassizii), salamanders, frogs, and Colubrid snakes. (Lepus), all of which can still be found in the region today. Three species of ground sloth are known from this site; Jefferson’s Ground Sloth (Megalonyx jeffersoni), Shasta Ground Sloth (Nothrotheriops shastensis), and the Harlan’s Ground Sloth (Paramylodon harlani), representing the families Megalonychidae, Megatheriidae, and Mylodontidae respectively. Of the three, Harlan’s Ground Sloth was the most common sloth found at the site. This species grazed in small herds and its remains are never found far from a permanent water source like that found at Fairmead. Like the kangaroo rats, Shasta Ground Sloths are associated with drier environments and were likely infrequent visitors to Fairmead Landfill. were a few of the major herbivores of the area. The ungulates found at the site were all adapted for life on open grasslands and either grazers or mixed-feeders. These include Mule Deer (Odocoileus hemionus), the pronghorns Capromeryx and Tetrameryx, the camels Hemiauchenia and Camelops, and several species of the horse Equus. These herbivores would have found ample grazing in the surrounding grasslands and would have visited the marsh regularly to drink. the largest animals represented here. The Columbian Mammoth (Mammuthus columbi) is well represented here. These giant grazers inhabited the plains, savannas, and open woodlands of North America and required regular drinking water like today's elephants. In contrast, the American Mastodon (Mummut americanum) is absent from this site. This indicates that there was a lack of tree cover in the area, which these browsers would have required to exist here long-term. The most common predators at Fairmead Landfill were Saber-toothed Cats (Smilodon fatalis) and Dire Wolves (Canis dirus). Elsewhere in the Americas, these two social predators are found in association with ancient marshland, wetland,floodplain, and riparian habitats. They would have ambushed medium-sized to large prey animals as they came to the water. The other large predator here, the Scimitar Cat (Homotherium serum), was much rarer at the site. A hunter of the open plains, this cat would have spent most of its time running down large herbivores on the grasslands. Coyotes (Canis latrans) are still alive today, occupying the arid to semi-arid lands of western North America east of the Mississippi River. Opportunistic hunters of small game, the Coyotes found at the Fairmead Landfill would have found plentiful prey in the local rodents, hares, and birds. The small pronghorn Capromeryx would have been a common year-round prey item, while the fawns of medium-sized ungulates such as the Mule Deer and the larger pronghorn Tetrameryx were taken opportunistically mostly during the rainy season. The Coyotes at Fairmead Landfill would have also readily scavenged from kills made by the larger carnivores at the site.